I have had many opportunities to speak at different churches, and most of the time when I go, I share the same message. It is a simple message where I take people on a journey of the entire Bible and show them that it is one story. That story, from Genesis to Revelation, is that God desires to redeem sinful mankind back to Himself for His glory. That’s it! Jesus then left us with a mandate that God has now chosen us, in His great mercy, to be His instruments or ambassadors of reconciliation. In the book of Acts, we see the disciples flesh that mandate out by planting churches wherever they went. Then, in the book of Revelation, we see the culmination of the work that God appointed us to do in the picture of a representative crowd from every people group worshipping around His throne. I end my message with a simple question: In light of all of this, what do you think we ought to be doing? By then, the answer is obvious that we should be continuing the work that Jesus and the apostles started of planting churches among all the people groups of the world. We must complete the commission that Jesus gave us and finish writing the book of Acts, so that the picture in Revelation will be realized. It never ceases to amaze me that every time I preach that message, I will have people come to me afterwards saying that they have never heard that before. I have also seen this story of the Bible change more people’s lives than any other message that I have preached. We have churches that are full of people that can win Bible trivia games. We host Bible study after Bible study. Anyone can look up the Greek or Hebrew translation of a word in Scripture. Our children memorize verses for prizes. We sing theologically correct worship songs. And every week, we hear sermons that move us with the slickest graphics and most humorous illustrations. But within all of this Christianity, we see very few people making disciples of all nations. This was not just a cute saying that we should slap it on paintings with an eagle, but it was a command from our Boss and Savior. I have had people come up to me, patting my back, and say that missions is just not for them or it is not their calling or gifting. I want to ask them if they have ever read their Bible! I believe that there are a lot of good people in our churches that have just been led astray from their purpose. I have seen that when some of these folks are faced with a simple mission education, their eyes are opened, real life-change takes place, and they start asking the right questions about what they should do with their lives. 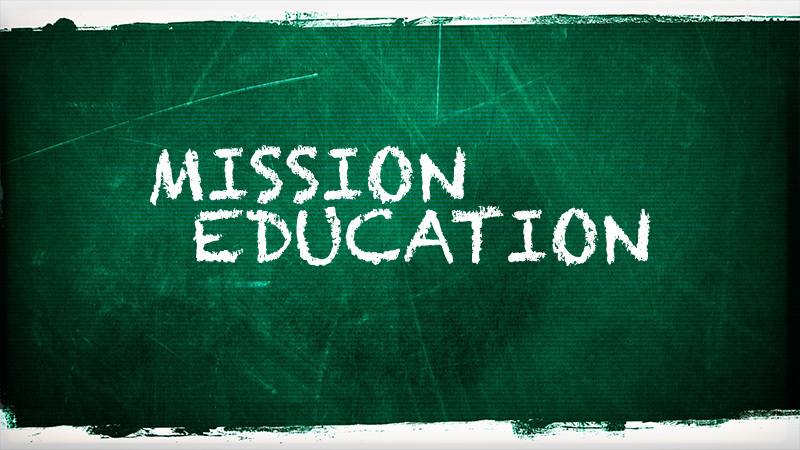 The best mission education out there that I have found is a course called Perspectives. God has used this course to do incredible things in people’s lives. I am constantly trying to get people to take this course, because I believe that it is the most important Bible study a person can take. If you are tired of running your own life and wasting it on frivolous things, Perspectives is the class for you. This Perspectives class is not easy. It is a commitment of 15 weeks. It costs $225, and you do a lot of reading and some homework. But, I promise, it will be the best thing that you have ever done. We are starting a new class at my church, Grand Avenue Baptist Church, this coming Monday at 6:30pm. If you are interested, you are welcome to attend this first class for free. We will have childcare available along with some great snacks. The speaker that night will be Sean Cooper. Sean is with an organization called the Traveling Team, and you will not want to miss him! He is a very gifted teacher with an incredibly challenging message. If you just know that you are going to take this class, you can register now at perspectives.org. If you have any questions about this class or other resources, please, contact me.